St. Ephraim of Nea Makri or St. Ephraim of Mount Amomon (Greek: Άγιος Εφραίμ Νέας Μάκρης / του Όρους των Αμωμών), believed to have lived from 1384 to 1426, is venerated as a martyr and miracle-working saint by many Orthodox Christians of Greece and abroad. His status as a saint is controversial to the secular West, as there are no sources testifying to his existence as a historical person. Believers regard him as a "newly revealed" ("νεοφανείς") saint, whose existence is a matter of divine revelation rather than historical proof. He has become one of the most beloved saints in the last thirty years and is a center of pilgrimage for the entire country of Greece. His martyric death is commemorated by the church May 5 and the discovery of his relics January 3. The relics were discovered through divine intervention in 1950; 524 years after his death. He was formally glorified by Constantinople March 2011. St. Ephraim's name and biography, complete with exact dates and details, is said to have been revealed to a hermit nun, Sister Makaria Desypri (1911-1999), in a series of divinely inspired dreams in 1950. Following these dreams, she believed she was led by God to restore the Monastery of the Annunciation in Nea Makri which had been destroyed by pirates in the fifteenth century. With the permission of the local bishop, she took possession of the partially built chapel and as she worked she eventually cleared away the rubble and prayed to find out more about the monk who had once lived there. This prayer was answered with a strong thought to "Dig up the earth here and you will find what you are looking for". With the assistance of a young worker they uncovered a fireplace, three small windows, and a partially ruined wall, indications that this had been a cell. A body believed to be that of the saint was found in the ground near the nun's hermitage, on the site of an abandoned medieval monastery on the slopes of Mount Amomon, near the town of Nea Makri, in Attica. The saint, whose body was kept as a holy relic, quickly became the object of popular veneration, as he came to be known as a worker of miraculous healing. On the site of his supposed life and martyrdom a Monastery of the Annunciation of Our Lady (Ιερά Μονή Ευαγγελισμού της Θεοτόκου) was later re-founded. In 1998, Ephraim was officially glorified a saint by the Synod of the Orthodox Church in Greece, pending approval by the Patriarch of Constantinople. 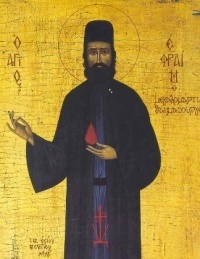 According to the dreams revealed to Makaria Desipri, St. Ephraim was born on September 14 1384 in Trikala, Thessalia. His civil name was Konstantinos Morphes. He became a monk, took the monastic name of Ephraim and moved to Attica to live in what was then the Monastery of the Annunciation of Our Lady on Mount Amomon. In 1424 the monastery was destroyed by marauding Ottoman Empire troops. Ephraim escaped and lived for another year as a hermit among the ruins of the monastery. In September 1425 he was captured in another Turkish raid. He was held captive and tormented for more than eight months, until he was finally tortured to death on May 5 1426. A mulberry tree, believed to be that on which the saint was hanged, is today shown as an object of veneration inside the re-erected monastery. St. Ephraim is portrayed in iconography as a slim, ascetic figure with black hair and beard, clad in the black robes of a monk. His feast days are January 3 (the anniversary of the discovery of his body), and May 5 (the anniversary of his martyrdom). The monastery in Nea Makri, the centre of the saint's veneration and his miracle-working, is now a much-frequented place of pilgrimage attracting thousands of visitors, especially people praying for the healing of illnesses. The Holy and Sacred Synod of the Ecumenical Patriarchate inducted St Ephraim of Nea Makri to its List of Saints of the Church of Greece March 4, 2011. An epistle was sent out by the Holy Synod of the Church of Greece to Ecumenical Patriarch Bartholomew requesting the recognition of Saint Ephraim, who was martyred in 1436 and whose miraculous relics were divinely revealed in 195o, within the membership of the List of Saints of the Orthodox Church. Sixty years after the discovery of the relics of the Saint, the Standing Holy Synod of Greece, in a letter sent - as required - to the Ecumenical Patriarch as the sole power to promote the request, requested that his memory be celebrated on May 5th as well as January 3rd, since on the latter date his holy relics were discovered. "the influx of pilgrims is massive, almost daily, and on Sundays and holidays the monastery is flooded with pilgrims from all of Greece.... The honor towards Saint Ephraim the New is clearly widespread throught Greece and outside of it.... There are churches dedicated to the Saint in Sitia and Tinos.... Icons of the Saint are venerated throughout the Orthodox world." "according to Orthodox tradition and order, the Orthodox Church proclaims and establishes saints according to the conscience of the ecclesiastical world, and the administrative authority of the Church simply confirms the faith of the pious people, and that such a decision is declaratory in nature." The Metropolitan Panteleimon was referring to the miracles of the Saint and the thousands of pilgrims who annually flood the monastery. A year later, while the Holy Synod of Greece called upon the Ecumenical Patriarchate to induct the Saint in the Hagiology, a conflict arose between the Metropolitan of Attica and the Monastery where St. Ephraim's relics lie and the issue became "frozen". Icon of Holy New Martyr Ephraim of Nea Makri on "OrthodoxPhotos.com"
This page was last edited on December 1, 2017, at 14:39.